The Ephesus Meeting is for Christian Colleges, Universities, Seminaries and Church Groups, as well as individuals. We anticipate the participation of many Christian institutions from all over the world. We would also like to see your institution attending this meeting with your special group. 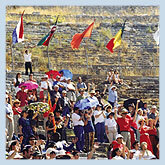 Various groups will have individualized itineraries and they will all come together at the ancient Ephesus Theater on Sunday, May 29, 2005. The May 29th activities will offer students and professors the opportunity for worship and study. Professors and Church leaders are invited to give lectures or seminars. There will be many lectures from Professors world wide on World Religion, St. Paul and the importance of Asia Minor in history and in Christianity. There will also be local Turkish students performing Folk Dances and Chorus singing on the stage of the ancient Ephesus Theater. We are inviting all Christians to join us in this journey of discovery. There will be Church Leaders, Professors, students and individuals, from around the world, attending The Ephesus Meeting. This annual Ephesus Meeting will take place on May 29th, 2005. The festivities and lectures will be from 9:00 am- 12:00 noon. Where is it? This Meeting will be in the Ancient Ephesus Theater located in the Ancient City of Ephesus. This massive theater which accommodates 24,000 spectators, dates back to the time of St. Paul the Apostle. With permission from the Ministry of Culture, we will have the private use of The Ephesus Theater. Mark Fairchild, a Bible Professor at Huntington College, Indiana, will be our focus lecturer and will be speaking about World Religion, St. Paul and the importance of Asia Minor in history and in Christianity. Dr. Ben Witherington, a Professor of New Testament at Asbury Theological Seminary, will also be lecturing at this event. 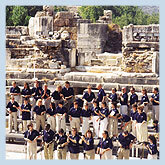 There will also be local Turkish students performing Folk Dances on the stage of the ancient Ephesus Theater. Colleges attending this meeting with a group can also use the stage for a limited performance of their choice, such as Dances, Chorus singing, etc. Professors and group leaders bringing a group can also give a non-denominational lecture for a limited time. We prefer lectures to be based on World Religions, Biblical or Theological issues. If you, or your group would like to give a lecture or performance, please contact us to make reservations.